Branded gift and paper shopping bags are an effective and cost-efficient strategy to spread brand awareness. For starts, they’re practical in a way that a billboard or online advertisement can’t be yet achieve the same marketing goals – impressions – on a more personal scale. A custom shopping bag also has surprisingly long-lasting power, as most customers will reuse a quality bag a few times. This only serves to further your reach. With an attractive, eye-catching logo or design, it’ll be used until it’s practically falling apart. Customized shopping bags are a natural fit for a retail store, but they certainly have use beyond traditional brick and mortars. Professional trade shows and conventions, holiday parties, and other events where you’ll be handing out gifts are all occasions to increase your brand reach by using a customized shopping bag. Unlike whatever freebies you’ll be passing out, a shopping bag stays in view for passersby to see. With over 20 years of service under our belt, ePromos is one of the top promotional product distributors in the world. Our credence is 110% satisfaction for every customer we partner with, from concept through product delivery. Below, we’ll walk you through the process of designing a gift or paper bag with us online. 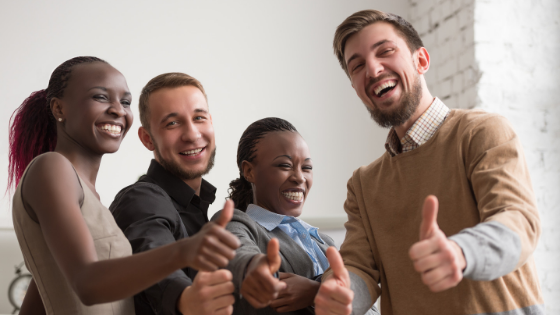 Then we’ll give you a refresher on all the specialty services we offer for companies, organizations and nonprofits of all sizes and industries. 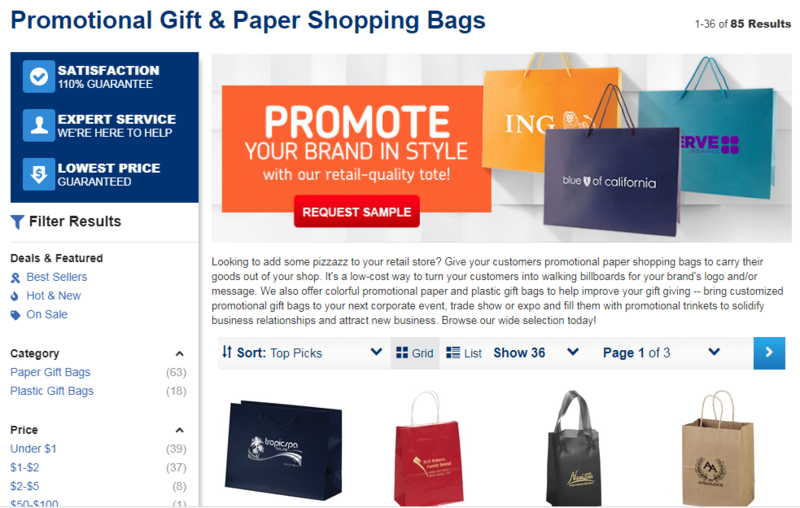 Step 1: Browse our selection of gift and paper shopping bags, right from the comfort of your office. No catalogs to sift through or phone calls to make (unless, of course, you’re into that). All 85 choices, from translucent frosted bags to glossy laminate finishes, are at your disposal as soon as you click on the link. NOTE: We offer free samples for all gift bags. Once you decide which bag you like, request a free sample. We’ll even let you choose which color you’d it to come in. The bag will be imprinted with artwork selected at random, to give you an idea of how a logo/branding looks on it. We’ll ship it out to you right away, so you can see the product in person – we know you won’t be disappointed. Step 2: Select a color. Some of our bags, such as the brown recycled kraft promotional bag, are only available in a single color, so no selection will need to be made. We recommend choosing one based on your artwork or messaging, as well as your brand personality. Step 3: Select a quantity. 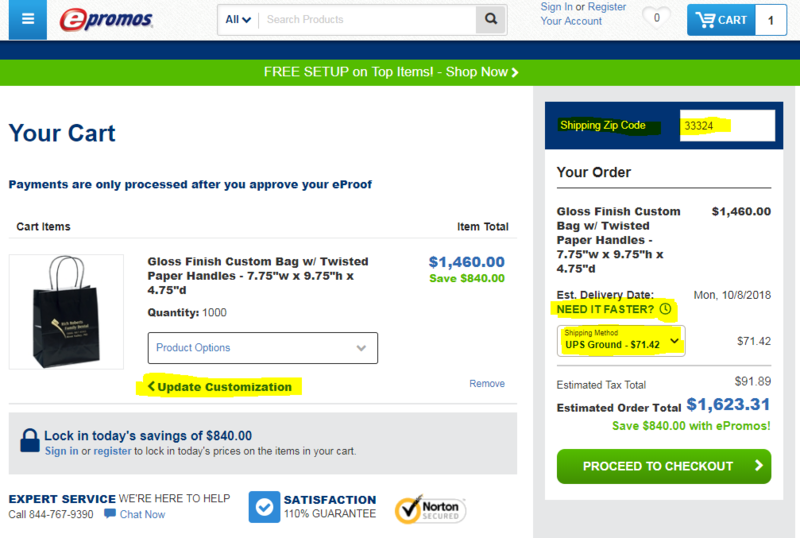 Keep in mind, the more you order, the greater your savings will be per bag. 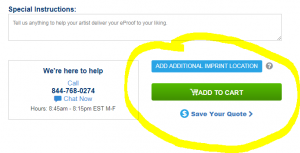 When you enter the quantity needed, pricing will automatically adjust! Right on the product page you can see 1.) How much you’re paying per bag, 2.) The discount received, and 3.) The total cost for your order – all in an instant. Step 4: Now comes the fun part: customization! At this step, you’ll be taken to a new window to choose ink colors, fonts, and any other visuals you’d like included. You can choose to add text, an image or both. You can type right into our text box and change the font, make it bigger, bold it, italicize it. All can be reviewed online in seconds flat. For customers that prefer us to create a design or other artwork, there is also the option to click “Let us do it for you!” at this step. You can click on “Contact me” and continue to check out, and our design artists will get to work creating your dream branding. Whichever option you choose at this step, you will have the option to send us “Special Instructions” where you can tell us anything you’d like to help us bring your vision to life. If you experience any trouble with this step, you always have the option to click “Contact Me”. 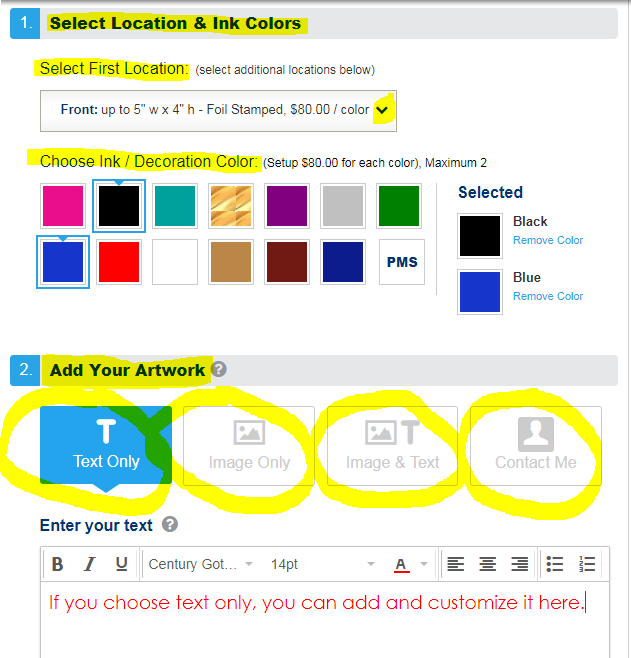 This allows you to finish checking out, and then connect with one of our design artists to discuss the best way to hand off your text and image for customization. Whether you choose to upload your text and image during Step 4 or ask to be contacted, you’ll receive an eProof mock up in 1-2 business hours for your review. We will never produce anything without your explicit approval of design. Should you experience any confusion, please don’t hesitate to call or “Chat Now” with us. We have product specialists on standby to help sort out any issues you may face while placing your order. Step 5: Click “Add to Cart”. At this step, you can review your order to ensure everything is correct. To make any changes, click “Update Customization” to go back to Step 4. 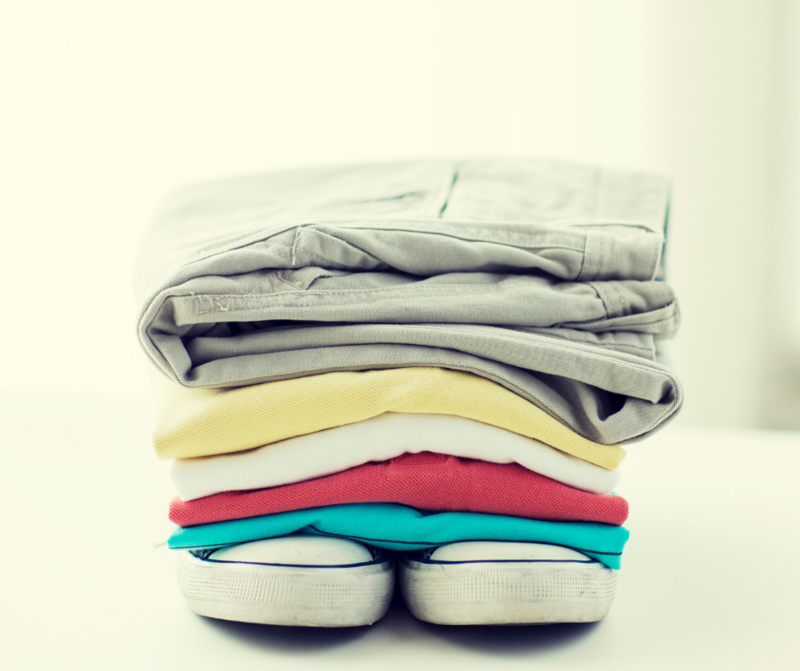 When everything looks good, enter your zip code for an estimate of delivery date and shipping fees. You’ll have several options, from UPS Ground to Next Day Air Early. If you need to rush your order, we can work with you to get it out the door as soon as possible. Please note, rush items may have limited availability in color options, but we’ll do our best to get you exactly what you want. 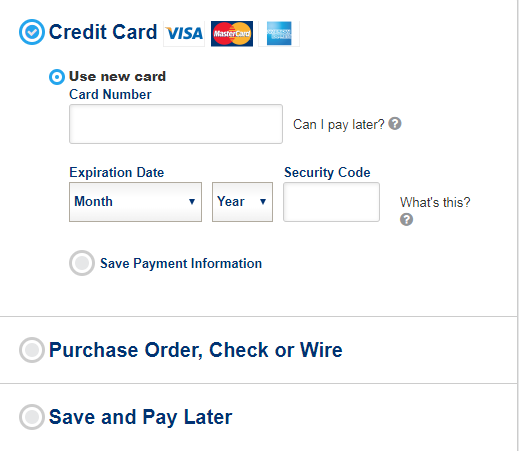 Step 6: Click “Proceed to Checkout”. Here, you’ll enter your shipping information and choose your shipping method. 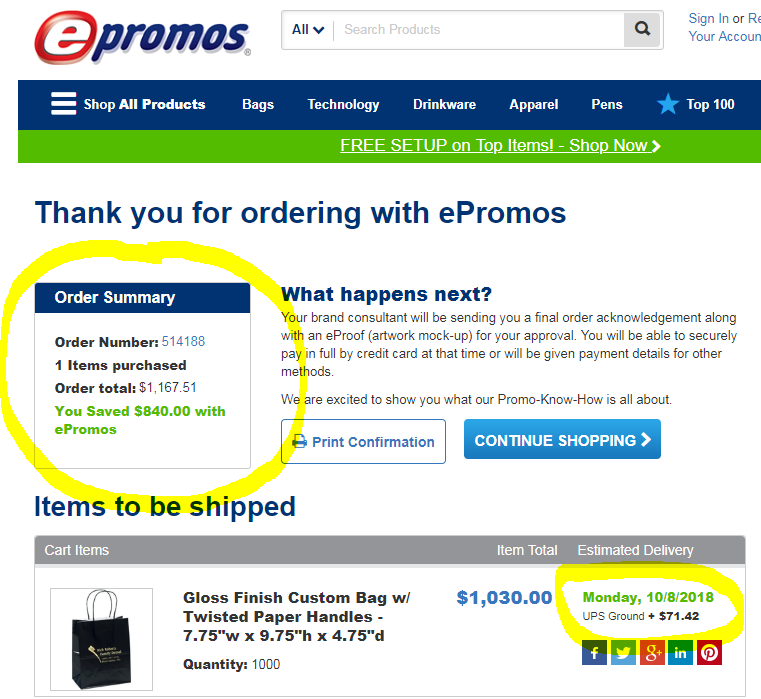 You’ll also have the opportunity to create an account at ePromos, which gives you $50 off your 1st order! Here you may also choose to use your own UPS account or request a “guaranteed delivery by” date. Once completed, you’ll be given an estimated delivery date as well as the total shipping charges. If you’re happy with those, click “Save and Continue”. Step 7: Next, you’ll be prompted to either sign in or check out as a guest, and then add in your billing, shipping and payment information. Options here include using a credit card, purchase order, money check, or wire. You can also opt to “Save and Pay Later”. 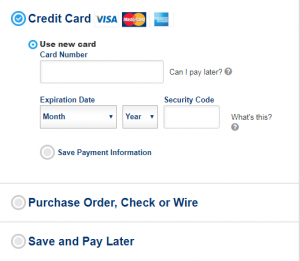 After filling out your preferred payment form, click “Save and Continue”. Step 8: It’s time to review your order! You’ll want to pay extra attention that all information you’ve entered is correct, from bag style and quantity to shipping address and delivery. If anything is amiss, simply click “edit” to re-enter any information requiring updating. If everything is correct, click “Save”. Step 9: This is your order confirmation page! You’ll be given an order number. A Brand Consultant will be in touch with you shortly to discuss next steps, as well as email you an eProof of your order to approve. Remember, we won’t begin producing your custom bags until you approve the eProof we send you. When you choose ePromos to produce your custom shopping bags, you’re not just ordering with us – you’re working alongside us (but don’t worry, we’ll do all the heavy lifting). We make every effort to ensure we’ve captured your vision. There are several ways to collaborate with our team, who is eager to get to work on your customized goods! Logo Design – If your branding is still a work in progress, we can help to complete it! Our team of talented graphic designers will whip up 5 unique designs and 2 revisions for only $300 with any order. We’ll incorporate any ideas or special requests you might have into the design, too. If this is the route you’d like to go, when placing an order, simply click “Let us do it for you!”. Our team will contact you in 1-2 hours to get started on your brand-new custom design. Artwork Services – Not in love with your current design? Let our graphic artists create a new one for you or polish up your existing material. We can work from rough sketches, a simple description, or through a quick conversation. Bonus: we offer free simple typesetting of your name and message. Promotional Product Rush¬ – Need your order now? We know you’re probably freaking out, but we’ve got good news. We have over 4,000 products that can be shipped out in 1 business day, and shipping methods as early as Next Day Air Early. You’ll be paired with a Promotions Specialist who will handle all the logistics of getting your order out the door ASAP – and accurately! Business Gift Packaging – Packaging can be a logistical nightmare for businesses, which is why we’re happy to provide it for our customers. Whether you need special embellishments or additional assembly, we can make it happen. We’re custom experts – let us take care of it for you! Online Company Stores – Selling your own branded gear and apparel is a huge feat… and a lot of work. Let us shoulder the work by running your virtual store and supplying your custom products. We’ll take care of everything from inventory management to shipping, both which save you warehouse space and man-hours. You’ll receive regular up-to-date sales and inventory reports that outline what’s selling, and when it’s time to reorder. To get your online store started, send us an email at storeteam@epromos.com. Custom Merchandise – Need something you can’t find anywhere else? We’ve got you covered. We can work with overseas resources to get your hands on products no one else has. This is a fantastic way to make sure your promotional products stands out against the competition. All you need to do is shoot us an email to get started, at specialaccounts@epromos.com. Your ePromos custom shopping bags (and any of our products!) are designed to your every specification. We work hard to ensure every customer is a happy customer. 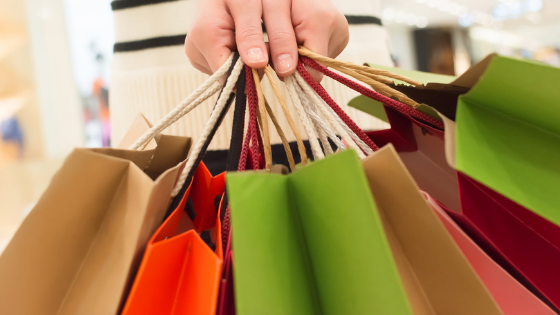 We look forward to taking your shopping bags to the next level with our custom branding process. Start browsing our selection of paper gift bags or plastic gift bags today! Wherever you go, promotional bags are there. You get them with your takeout food at restaurants. You see them in grocery stores, gyms, schools. Heck, even funeral parlors use bags. Bags are engrained in our lifestyles. When we have stuff to schlep, bags get it done. For marketers, bags imprinted with your logo are perfect for getting your brand seen everywhere. Bags are like billboards – they attract a ton of eyeballs, and you can’t help but read the message. But here’s where promotional bags beat billboards every time: They’re useful. People love receiving items that serve a purpose. If it’s something they can use, they’ll keep it. You zip past a billboard, but you keep (and use) bags. When asked why they keep logo bags, 91% of people say because they’re useful. How the bag looks is also important. Thirty-four percent of people will keep a bag if it looks good. Did these stats surprise you? Let’s explore the infographic below to glean even more insight about promotional bags. 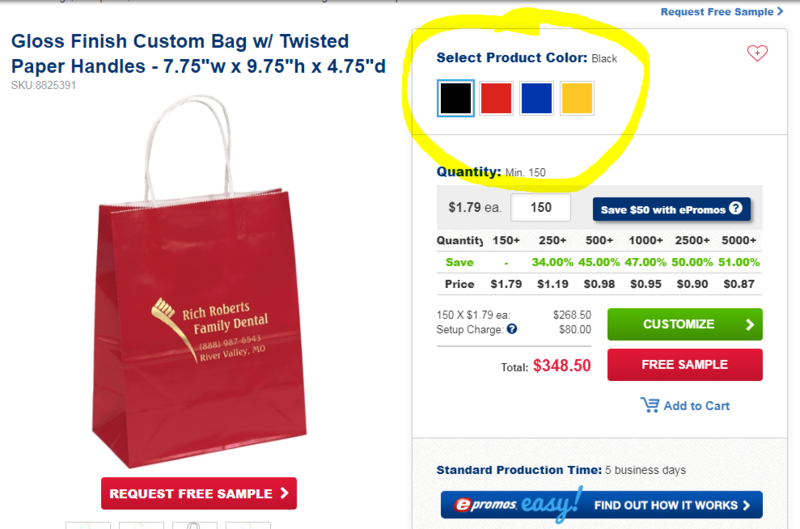 You can also click here for hundreds of bags just waiting to be customized for your brand. We’ve shared some great uses for custom tote bags, and here’s another one: use them as fundraising tools. That’s exactly what California Pizza Kitchen (CPK) is doing. The famed pizza restaurant with more than 250 locations in more than 30 states and 11 countries is selling tote bags imprinted with its logo – and it’s all in the name of charity. Customers can purchase one for a buck, and CPK will donate 50 cents to Make-A-Wish Foundation, the premier wish-granting organization for children. The fundraiser lasts all year, and CPK has committed to donating up to $100,000. This isn’t the company’s first philanthropic endeavor – it has donated more than $1 million through its CPK Foundation, FUNdraisers, and in-kind donations. Feeling inspired for your business to give back in some way? 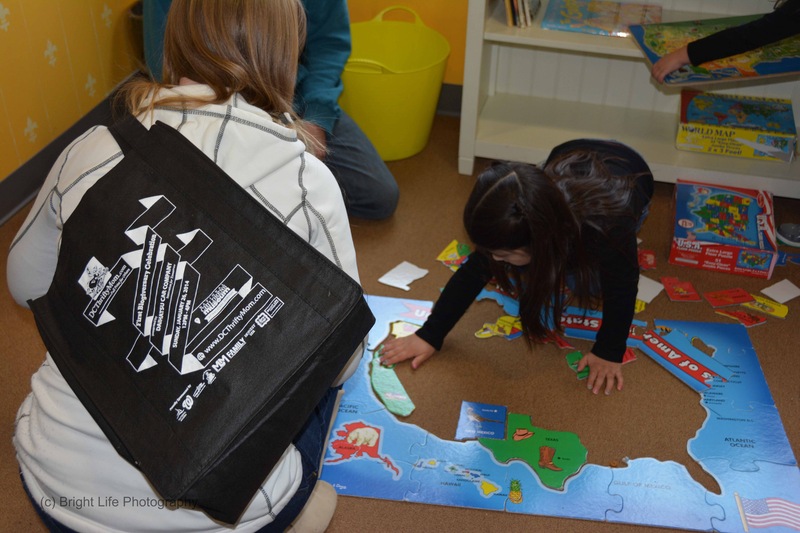 Put promotional products to work for a charitable purpose. Custom tote bags are great for CPK because they fill an immediate need for customers – they’re the perfect size for shimmying in some takeout pizza boxes. And because they’re priced at $1 a piece, it’s easy for customers to grab one to go, and maybe a couple more to take home or give to friends. With an increasing number of plastic bag bans going into effect around the country, people have a need for reusable tote bags now more than ever. Think about imprinting your logo on tote bags and turning them into fundraisers for a charity that’s important to your business. CPK’s fundraiser is a great example of how a simple promotional product can do some serious good for a brand and a charitable organization. 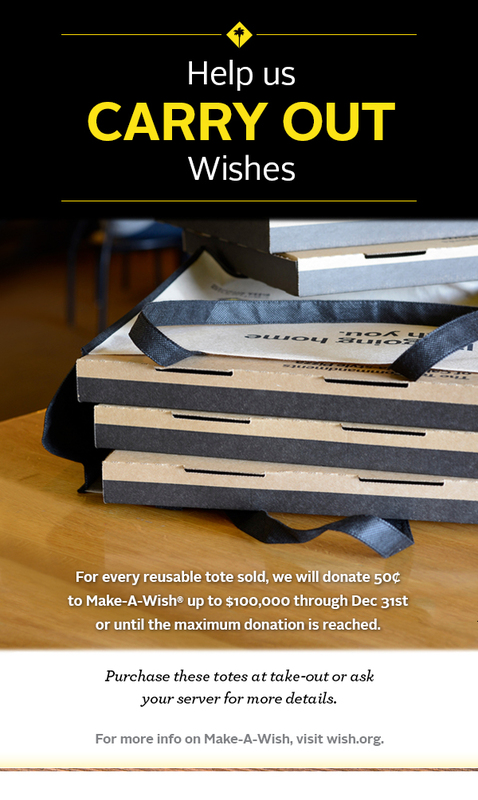 CPK gains exposure and goodwill, and Make-A-Wish benefits from the funds. Has your business ever used promotional items to raise money for an organization or cause? Custom bags: You see them everywhere. They’re one of those perpetually useful promotional items that can spread the word about any brand. And at an average of nearly 6,000 impressions (more than any other promotional product, according to the Advertising Specialty Institute), promo bags get marketers some seriously impressive exposure. For our client, Nicole, aka DC Thrifty Mom, the extraordinary brand exposure at an affordable price point made custom logo bags an ideal giveaway to promote her blog, DCThriftyMom.com. 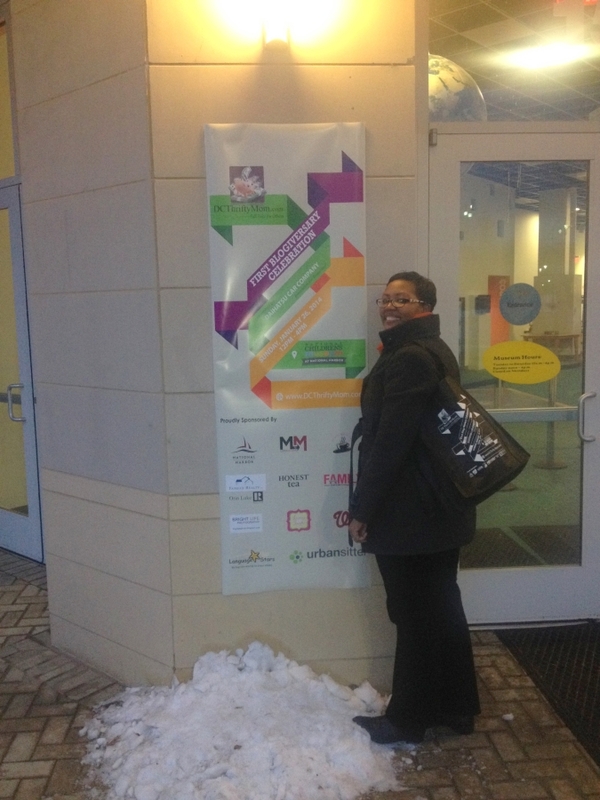 Nicole created the blog, which is geared toward families in the DC Metro area, last year. “I started the blog to offer a free resource to my community by highlighting free, cheap and discount happenings,” she says. Meet Nicole, the creator and owner of DCThriftyMom.com. The blog attracted about 1,200 frugal-minded followers within the first six months, and today generates an average of 20,000 views per month. Did Nicole ever dream the blog would take off the way it did? As the first anniversary of DCThriftyMom.com approached, Nicole wanted to give her audience something she knew they’d appreciate: a family-friendly event and useful freebies. And so the 1st Blogiversary Celebration was born. The family-friendly bash, held at the National Children’s Museum (NCM), an interactive children’s museum in the DC area, featured local businesses, organizations, performances, interactive exhibits, and, perhaps most appealing to the 1,000+ attendees, promo bags filled with free stuff. Go to almost any event – tradeshow, conference, festival – and there will likely be swag bags filled with goodies. The 1st Blogiversary Celebration was no different. Nicole contacted ePromos to order promotional tote bags to distribute during the event. In classic black with a white imprint, the bags were bold, eye-catching promotional giveaways that helped spread the word about DCThriftyMom.com and the blog’s sponsors. Nicole selected these particular bags for a number of reasons: they’re reusable with a large, double-sided imprint space, they have reinforced handles with a sturdy bottom, and they were priced to fit her budget (many totes are priced under a buck a piece). Promotional bags were perfect for attendees to sling over their shoulder and enjoy the event. There’s another reason Nicole chose to hand out custom bags: Plastic bags are taxed in the DC area. Of course the custom bags weren’t handed out empty. Inside were all kinds of freebies geared toward budget-minded families: discount sporting tickets from the Washington Nationals, free foreign language classes for kids, information from various mom support groups, and other giveaways. The great thing about custom bags is that they’re effective for bloggers and mega-brands alike. 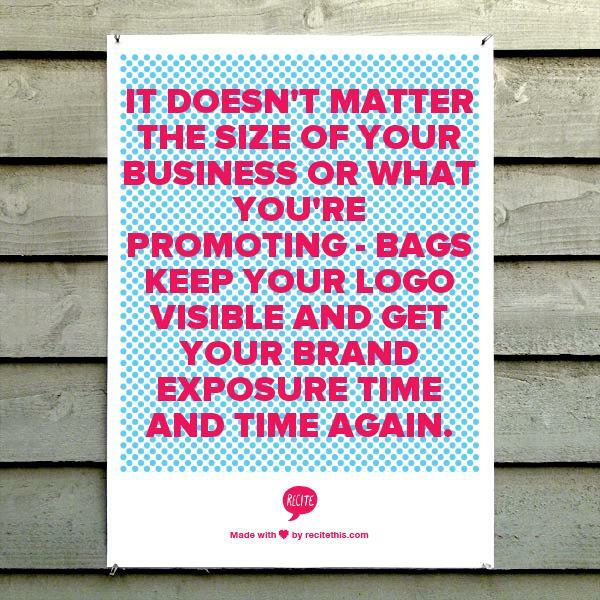 It doesn’t matter the size of your business or what you’re promoting – bags keep your logo visible and get your brand exposure time and time again. In fact, studies show bags get used an average of nine times per month. What type of bag is most appealing to your target market? Are they, like DCThriftyMom.com’s readers, busy moms who need a way to transport groceries? Are they college students who could use a great backpack? Business travelers who could benefit from a checkpoint-friendly laptop bag? 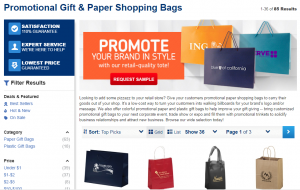 The most important factor when deciding on promotional bags is determining who will be receiving them. Define your purpose for handing out bags. Why are you giving bags in the first place? Are they swag bags on which you want your logo to be bold and noticeable? Are they client gifts where perhaps a more subtle logo is a better choice? Think about your objective when using the bags. Do you want to get your name out to the masses? Provide a luxe gift for loyal customers? Clarifying your purpose is another key element when using bags. Know what’s going inside the bags. Custom bags are designed to tote stuff around, and it’s important to consider the size and weight of what may be placed inside. If you’re using custom bags in place of single-use bags at your business, for instance, you’d want to opt for a bag sturdy enough and sized right to carry contents. Here are a couple examples: See how bags were used in a retail setting, and see why tote bags are great for takeout. The key to using custom bags is selecting the right bag for your audience and purpose. You want recipients to appreciate receiving the bag and actually get to use it. In the case of our client, DCThriftyMom.com, tote bags turned into swag bags fit perfectly with the blog, the event, and the audience. Want more on how to use bags in a promotion? Check out our Slideshare on what you need to know about custom tote bags. Let’s hear from you: Have you promoted your business with custom bags? Tell us about the promotion in the comments! Custom tote bags are promotional items that get your message a ton of mileage. They have a huge imprint space, and they get thousands of impressions – almost 9,000 for the average bag. The shop fills the bags with a custom pen and a CD featuring the owner of the boutique, flutist Joan Sparks, and hands them out at tradeshows throughout the year. More than 1,000 custom tote bags have been given to flutists from around the globe, getting Flute Pro Shop worldwide exposure. Flute Pro Shop is smart to use the bags for what they’re designed to do – hold stuff. Rather than hand out empty tote bags at conventions, the shop includes some nice extras inside. Everybody can use a new pen, and the CD humanizes the Flute Pro Shop brand. Recipients can enjoy harmonies right from the shop’s owner. We also love how the shop uses the bags as shopping bags. There’s a huge difference between receiving a brand-new or just-repaired flute in a custom tote bag instead of a disposable bag. It instantly elevates the experience. The bags have a substantial, elegant feel to them – they’re worthy of toting home a shiny, silver flute. The biggest benefit, though, is that recipients now have a bag they can use over and over. Flutists can use them for any number of things, and because the website is imprinted along with the logo, people know exactly where to find the shop. 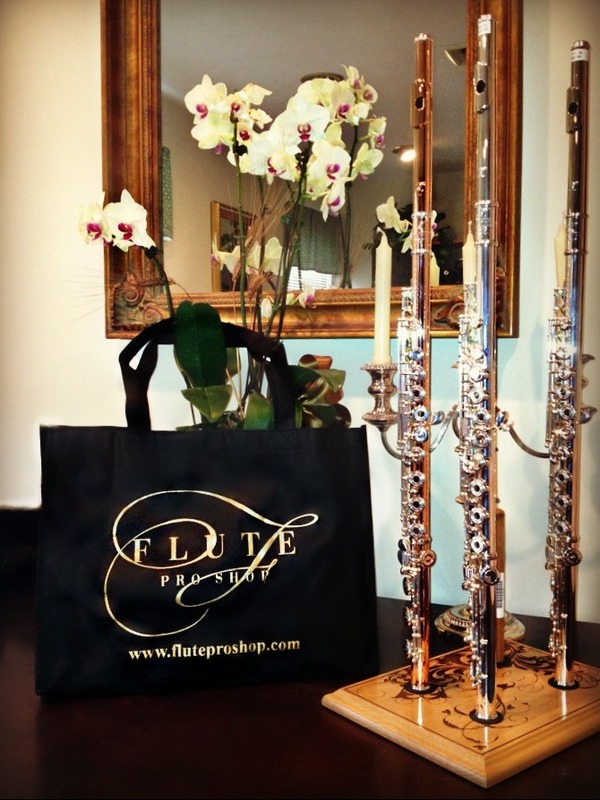 The bags are a useful gift for recipients and an excellent marketing tool for Flute Pro Shop. Want to know more about marketing with custom bags? Check out our Slideshare on promotional tote bags.